The Flora Grubb Gardens in San Francisco. The Bayview District has earned a reputation as home to high profile community gardening projects and one might surmise that the surge of eco-friendly camaraderie can be attributed to the 2007 opening of Flora Grubb Gardens. This delightful botany center is definitely a positive high profile addition to an otherwise mundane mixed use neighborhood consisting of industrial, residential, commercial buildings rolled out block after block. While basic plant and garden supplies are available at Flora Grubb, there is also an abundance of unusual, clever lifestyle products to choose from as this flourishing oasis caters to the needs of urban gardeners, wanna’ be farmers, and a big chunk of us that enjoy the good life of patio, terrace and deck living. In truth, those who consider the outdoors as a wonderful place to relax, sit, nap, sip and dine can enjoy Flora Grubb Gardens just as much as diggers and planters. Keep Flora Grubb Gardens in mind when shopping for gifts because this spread has something for everyone. There are ceramic lattice stools in bold colors, glazed spheres that come in handy while contemplating life and even do-it-yourself terrarium kits. The packages of butterfly decals can find an area to decorate on a wall or window. 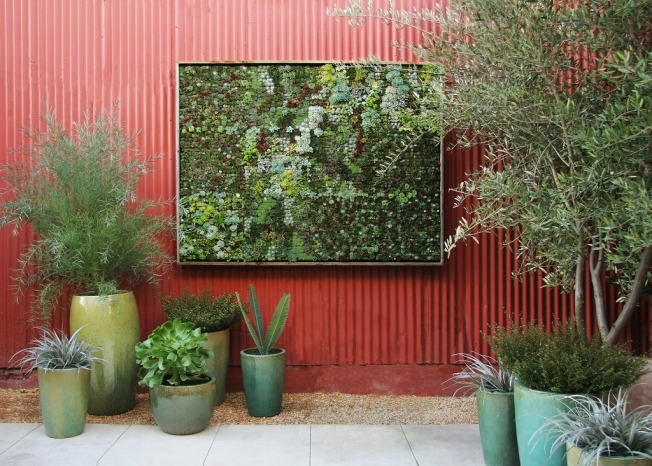 The spectacular vertical gardens are living wall art masterpieces and not difficult to maintain. The grounds at Flora Grubb are designed with open areas, retail rooms, planting alcoves and secret gardens. Just latch on to one of the red wagons and mosey around. You’ll be content to wander amidst the exotic succulents, budding bushes and wispy ferns. This San Francisco treasure is definitely a destination stop for locals and visitors.